Voting LNP ALP Axis of Evil is Voting for child Abuse from Trafficking. I have proven false allegations of DV, proven corruption in Queensland Government, have court orders for my 5yo to see me every week, I have been in family corrupt court for 5 years, legal aid Queensland has blocked contact for over 2 years. I am still waiting new orders from August 2014 trial. Would be good if you will write to your state and federal members as this is their job to do my son has been denied his inalienable rights and free liberties by corruption in our government to see and be with us. We need to get Tough on public service crime and corruption, we are very much under attack, we need leadership. My Surfers Paradise State and Fed LNP reps got me on charges s474.17 a fed indictment from an email on my sons 5th birthday, in defense of my young son, I’m getting a summary trial, no legal aid, no legal rep, no jury, 3 years prison. Offences against a law of the Commonwealth punishable by imprisonment for a period exceeding 12 months are indictable offences, unless the contrary intention appears. , and subsequent private prosecution of systemic corruption and child abuse under the Australian family law act. The Parliament and government are linked in the relationship known as ‘responsible government’, which was described earlier. For this reason, we consider them together. These are powerful institutions, which control the law-making process. Potentially, they protect rights in two ways: positively, by passing laws to protect rights that are not currently protected and negatively, by restraining themselves from making laws to infringe rights that are recognized by the common law or international law. CRIMES ACT 1914 – SECT 28 Interfering with political liberty Any person who, by violence or by threats or intimidation of any kind, hinders or interferes with the free exercise or performance, by any other person, of any political right or duty, shall be guilty of an offence. A person is incapable of being chosen or of sitting as a Member if he or she has been convicted of bribery, undue influence or interference with political liberty, or has been found by the Court of Disputed Returns to have committed or attempted to commit bribery or undue influence when a candidate, disqualification being for two years from the date of the conviction or finding.. Unfortunately it will get worse, our public services attract antisocial types, sociopaths, psychopaths, pedophiles, narcissus like flies. Question is how do we fix it, given our public service is working against us. We need to organise real people to take up parliamentary seats. candidates, independents or otherwise. Here attached is good reading to begin 2015 with thanks to Lone Fathers Association Australia for the great job they do in producing a great newsletter. Note the branches listed and get along and give force to change in 2015 or if no branch is in your area get one started and contact Barry Williams to help you get another branch up and running. Not only for the duration of your own case but for years after like me now over 15 years and still driving for the equality of fathers out of Government Administration. Here’s an easy start of something very positive right now offsetting feminist propaganda about domestic violence. 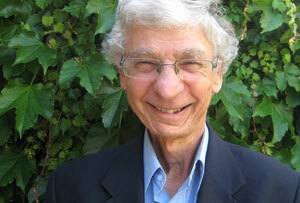 Read Bliney Dan on page 21 and read Professor Patrick Parkinson Report on false allegations attached here. Run off a few copies of his research he submitted to The Senate and get an appointment with your nearest Station Sergeant and explain to them how false allegations leave harm upon the father falsely accused and that false allegation can be prosecuted by police under the Police Administration Act for also being a waste of Taxpayers Resources especially under budget cuts. If it still goes to court as a false allegation it then comes under the Criminal Code Act for the misuse of courts and the penalty for the false claimant is the same as what they were trying .to have falsely imposed. A false report is a serious legal matter not being properly handled by police. Run off the ABS stats too for police. They are GOVERNMENTS OWN STATISTICS that police should be heeding as the status quo. And that Police must by way of their Oath of Office abandon their long ago adopted and unlawful feminists solely male blame Duluth Model of administering Domestic Violence. Excerpt of submission to the Senate Committee: There is now a very widespread view in the community that some family violence orders are sought for tactical or collateral reasons to do with family law disputes. People have become very cynical about them. A national survey conducted in 2009, with over 12,500 respondents, found that 49% of respondents agreed with the proposition that ‘women going through custody battles often make up or exaggerate claims of domestic violence in order to improve their case’, and only 28% disagreed. While it might be expected that men would be inclined to believe this, 42% of women did so as well. The view that some family violence order applications are unjustified appears to be shared by state magistrates in New South Wales and Queensland. Hickey and Cumines in a survey of 68 NSW magistrates concerning apprehended violence orders (AVOs) found that 90% agreed that some AVOs were sought as a tactic to aid their case in order to deprive a former partner of contact with the children. About a third of those who thought AVOs were used tactically indicated that it did not occur ‘often’, but one in six believed it occurred ‘all the time’. A similar survey of 38 Queensland magistrates found that 74% agreed with the proposition that protection orders are used in Family Court proceedings as a tactic to aid a parent’s case and to deprive their partner of contact with their children. 90% of surveyed NSW Magistrates agreed that AVOs were sometimes or often sought as a tactic in order to deprive a former partner of contact with the children. In research that our research team recently published on the views of 40 family lawyers in NSW, almost all solicitors thought that tactical applications for AVOs occurred, with the majority considering it happened often. In another study based upon interviews with 181 parents who have been involved in family law disputes, we found a strong perception from respondents to family violence orders (both women and men) that their former partners sought a family violence order in order to help win their family law case. This is a quote from one of the women in our study. Her former husband, who we also interviewed, sought an apprehended violence order (AVO) to keep her away from the house after she had left it. A survey of 38 Queensland magistrates found that 74% agreed with the proposition that protection orders are used in Family Court proceedings as a tactic to aid a parent’s case and to deprive their partner of contact with their children. She said this: “I thought this is ridiculous. What’s he giving me an AVO for? I haven’t done anything to him. I haven’t hit him, kicked him. We never had any violence in our marriage. Why have I got an AVO? … you can put an AVO on someone and say that they’re violent, and the only way you can get a child off their mother is because they’re violent. And that’s why I think he gave me the AVO.” The belief that family violence orders are a weapon in the war between parents is fuelled by the fact that judges are required under the Family Law Act to consider such family violence orders in determining the best interests of the child. The proposed clause in this Bill takes the law back to what it was before 2006, without any explanation for why Parliament should reverse its previous decision at least to limit the provision. It really doesn’t matter whether this belief that family violence orders are used tactically is true or not. The fact is that the perception is out there and it is held by state magistrates and family lawyers, as well as the wider community. The retention of this provision in the Family Law Act simply fuels the suspicion that family violence orders are being misused. This is damaging to the credibility of the family violence order system and the courts.The second reason why the requirement to consider family violence orders ought to be removed is that this serves absolutely no purpose. Yes, the court needs to know about the existence of a current family violence order in order to consider how to frame its own orders (s.60CG), but that is dealt with by requiring people to inform the court of such orders (s.60CF). Why consider them again in deciding what is in the best interests of a child (s.60CC(3))? The court is already required to consider the history of violence. What does it add to require the court also to consider a family violence order? The impression given by the legislation is that these orders are somehow evidence that there has been violence. However, that is a misunderstanding. In research that our research team recently published on the views of 40 family lawyers in NSW, almost all solicitors thought that tactical applications for AVOs occurred, with the majority considering it happened often. We congratulate people like Sue Maynes and many others, who have toiled for years to try to get something done about the situation. We have waited and waited for someone to act, hoping someone would, and having waited for years, with nothing happening, we decided to do it ourselves. Together, we quietly formed an alliance with other hard working sovereign people from other States, issued the writs this week in the High Court, serving them this afternoon. It was a tremendous rush, to get them in to the High Court before they close tomorrow for the year, and we sincerely thank all those who gave their all to get them sent in time for issuing this afternoon in the High Court in Canberra.. The Chief Justice Mr. French does not have long to act, and he must act. If he does not, he may be charged with high treason, which according to law, is punishable by death. YOU WON’T SEE THIS IN THE MAINSTREAM MEDIA ANY TIME SOON! A US-based men’s rights group has purchased a similar domain name to promote its own cause. The URL whiteribbon.org directs to a website that looks very similar to whiteribbon.org.australia, but is run by a group calling itself ‘A Voice for Men’. It also uses the name ‘White Ribbon’, but claims to be raising awareness about domestic abuse as a non-gendered issue, highlighting men also as victims and the effects on children. The “copycat” website claimed that violence against women was an exaggerated myth at the cost of men. The group claimed on its website that the idea of a female victim of domestic violence was manufactured, accusing universities and researches on domestic violence prevention of man hating. National Executive Engagement Officer for White Ribbon Australia, Fayssal Sari, told SBS the group was using deceitful tactics to mislead people who had genuine concerns for victims of domestic violence. Listen: Fayssal Sari speaks with Widyan Al Ubudy. AUSTRALIAN DEMOCRACY ONLINE PARTY, DEMOCRACY 2.0 THE UPGRADE Only together we can over run the ALP LNP Cults with our own direct democratic party, to make the changes we want and need for our children and our children’s children. Change won’t happen unless we make it happen, we have to do it together as one, unless we do we will relive history. Point is laws are only any good if they protect us and our rights, freedoms and liberties, laws are only good if they are upheld at all times equally. It is obvious to most that the government and pathetic judiciary, our employees do not up hold the law nor the spirit of the law, because they hold us in contempt and this is why we are here to be a political force to deal with them, because they believe we work for them, and in reality we do, we work and pay them tax an they hold us in contempt..
TODAY marks 12 months since the last time Adam (not his real name) saw his daughter. 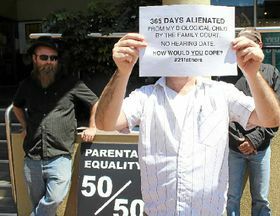 He marked the occasion by staging a protest outside the Family Court in Lismore along with a couple of other dads who have been through lengthy court cases in order to see their children. “Every adjournment is a sentence for the non-custodial parent,” Adam said. The court has ordered that Adam be given supervised visit with his daughter every fortnight. He drove to Coffs Harbour for these visits on a number of occasions, but the mother decided it was too stressful for their daughter and just stopped coming. Many of the delays in his case are because the judge is based in Townsville and only occasionally put on the Brisbane circuit, which includes the Lismore Family Court. Adam’s story resonated with several passers-by who offered support while The Northern Star was visiting. “We went through it and everyone came out bitter and twisted. It’s a f**ked system,” one woman offered. One father said in order to be eligible for Legal Aid, he had to give up his job. Adam has spent so much time studying the legal proceedings of his case, he is now studying law at SCU and one day hopes to be able to help other dads in Family Court matters. Erin Pizzey, founder of the battered wives’ refuge, on how militant feminists – with the collusion of Labour’s leading women – hijacked her cause and used it to try to demonise all men. During 1970, I was a young housewife with a husband, two children, two dogs and a cat. We lived in Hammersmith, West London, and I didn’t see much of my husband because he worked for TV’s Nationwide. I was lonely and isolated, and longed for something other than the usual cooking, cleaning and housework to enter my life. By the early Seventies, a new movement for women – demanding equality and rights – began to make headlines in the daily newspapers. Among the jargon, I read the words “solidarity” and “support”. I passionately believed that women would no longer find themselves isolated from each other, and in the future could unite to change our society for the better. Within a few days I had the address of a local group in Chiswick, and I was on my way to join the Women’s Liberation Movement. I was asked to pay £3 and ten shillings as a joining fee, told to call other women “sisters” and that our meetings were to be called “collectives”. My fascination with this new movement lasted only a few months. At the huge “collectives”, I heard shrill women preaching hatred of the family. They said the family was not a safe place for women and children. I was horrified at their virulence and violent tendencies. I stood on the same platforms trying to reason with the leading lights of this new organisation. I ended up being thrown out by the movement. My crime was to warn some of the women working in the Women’s Liberation Movement office off Shaftesbury Avenue that if it persisted in cooperating with a plan to bomb Biba, a fashionable clothes shop in Kensington, I would call the police. Biba was bombed because the women’s movement thought it was a capitalist enterprise devoted to sexualising women’s bodies. By that time, I’d met a small group of women in my area who agreed with me. We persuaded Hounslow council to give us a tiny house in Belmont Terrace in Chiswick. We had two rooms upstairs, two rooms downstairs, a kitchen and an outside lavatory. We installed a telephone and typewriter, and we were in business. Every day after dropping my children at school, I went to our little house, which we called the Women’s Aid. Soon women from all over Chiswick were coming to ask for help. At last we had somewhere women could meet each other and bring their children. My long, lonely days were over. No one would help me then and nobody would ever imagine that my beautiful, rich mother – who was married to a diplomat – could be a violent abuser. I quickly discovered, as battered women with their children poured into the house, that whatever was going on behind other people’s front doors was seen as nobody else’s business. If someone was beaten up on the street, it was a criminal offence; the same beating behind a closed door was called “a domestic”‘ and the police had no rights or power to interfere. So in 1974 I decided to write Scream Quietly Or The Neighbours Will Hear, the first book in the world on domestic violence. I revealed that women and children were being abused in their own homes and they couldn’t escape because the law wouldn’t protect them. If a husband claimed he would have his wife back, she couldn’t claim any money from the Department of Health and Social Security, and social services could only offer to take the children into care. Meanwhile, our little house was packed with women fleeing their violent partners – sometimes as many as 56 mothers and children in four rooms. All had terrible stories, but I recognised almost immediately that not all the women were innocent. Some were as violent as the men, and violent towards their children. After a stormy argument, I left the hall with my abused mothers – and what I had most feared happened. Our grant was given to them and they had a legitimate reason to hate and blame all men. They came out with sweeping statements which were as biased as they were ignorant. “All women are innocent victims of men’s violence,” they declared. When, in the mid-Eighties, I published Prone To Violence, about my work with violence-prone women and their children, I was picketed by hundreds of women from feminist refuges, holding placards which read: “All men are bastards” and “All men are rapists”. In 1990, Harriet Harman (who became a Cabinet minister), Anna Coote (who became an adviser to Labour’s Minister for Women) and Patricia Hewitt (yes, she’s in the Labour Cabinet, too!) expressed their beliefs in a social policy paper called The Family Way. With that report in my hand, I tried to reason with Joan Ruddock, who was then Minister for Women. The figures for battered men were “minuscule” she insisted and she continued to refer to men only as “perpetrators”. I believe that the feminist movement envisaged a new Utopia that depended upon destroying family life. In the new century, so their credo ran, the family unit will consist of only women and their children. Fathers are dispensable. And all that was yoked – unforgivably – to the debate about domestic violence. To my mind, it has never been a gender issue – those exposed to violence in early childhood often grow up to repeat what they have learned, regardless of whether they are girls or boys. I look back with sadness to my young self and my vision that there could be places where people – men, women and children who have suffered physical and sexual abuse – could find help, and if they were violent could be given a second chance to learn to live peacefully. We need an inclusive movement that offers support to everyone that needs it. As for me – I will always continue to work with anyone who needs my help or can help others – and yes, that includes men.